We haven’t posted a refresh for our gaming pc peripheral recommendations for quite some time. These suggestions showcase some of the best gaming pc keyboards, gaming pc mice and gaming pc monitors that can go hand in hand with the best 2017 pc builds of the month. 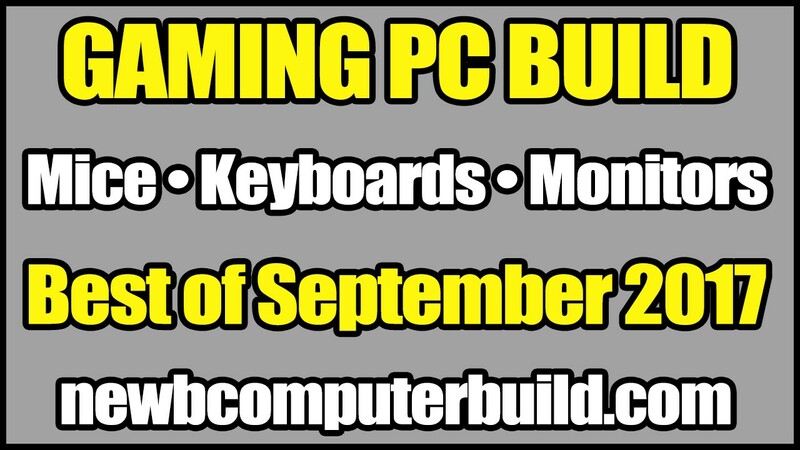 These recommendations are to be used as an attachment to the September 2017 Gaming PC Builds of the Month, so please check those out if you’re in the market for a new gaming pc build. The peripherals listed are arranged into three categories (Higher-End, Mid-Range & Basic) that best reflect a few general categories and are geared towards pc gamers. Since pc peripherals don’t inherently increase your pc gaming graphics performance in any way, they are categorized with both price and functionality in mind into either High End, Mid-Range or Basic categories. Generally, the categories are ranked by the type of hardware you have (such as a higher end monitor would most likely correspond to a high end gaming PC with a higher performing graphics card). Some exceptions may be gaming mice or keyboards, where a lot of its actual performance is a result of a gamers preference, playing style or types of games they play. The “higher end” peripherals are meant to showcase some of the more popular higher end / gaming specific peripheral hardware that one might consider to have the top of the line gaming peripherals or more of the “best” overall type of peripheral hardware — keeping in mind, these are not the most expensive gaming hardware peripherals one can buy, but a collection of the higher quality / more popular hardware for gamers in a few different categories. If you play specific types of games (MMO’S vs high FPS) then you might want to look into specific gaming hardware geared for those game types, either way the list below should still be relevant. This is a superb mechanical keyboard with cherry mx switch keys and a full rgb color array that’s fully customizable (up to an individual key). This is Corsair’s fastest mechanical keyboard with 100% anti-ghosting and more. Read the full specifications here at corsair.com. The mouse included as the “best overall” is the Logitech G502 Proteus Spectrum RGB Tunable Gaming Mouse — which now has programmable RBG lighting. This is a very comfortable all around gaming mouse with 11 large programmable buttons and easily one of the best mice out there, and is a great mouse for playing any time of PC game. The monitor chosen for the high-end gaming monitor is the Acer Predator XB271HU — a 27″ WQHD (2560×1440) NVIDIA G-SYNC IPS Monitor, of which the $1500 gaming pc build in the gaming pc builds of the month article will be able to push. The mid-range category is perfect for those that want to still have great gaming peripherals, but not necessarily the most expensive. The mid-range peripherals are most likely geared more towards gamers that want a little more then the basic gaming necessities in order to have that slight edge while gaming in the specific games they may be interested in. Here we have the Corsair Strafe Cherry MX Mechanical Keyboard. This is a great looking mechanical keyboard with cherry mx key switches (a very satisfying keyboard to game with and my preference), dynamic backlighting, endless programming with the ability to reassign any key or set up for extreme macros and more. Learn and read more at corsair.com. The Razer DeathAdder Elite forms to your hand like no other, this is a simple not so simple mouse. It has a 16 000 dpi optical sensor with a 99.% resolution accuracy. This is a super durable mouse with some fun adjustments — such as customizable color options with it’s chroma lighting. The ASUS VG248QE is a 24″ full HD 1920×1080, 144Hz refresh rate with a 1ms response time monitor built purely for gaming. At 144hz you get super smooth gameplay at 1080p. Here we have a very affordable gaming keyboard that you can pick up for under $50 — and yes it’s a mechanical one. 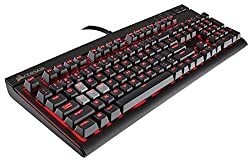 This keyboard has a minimalistic layout which is great for those smaller desks or perhaps for those that don’t need extra keys you don’t use anyways on your keyboard (I’m a huge fan of the minimalistic keyboard layout for gaming). This is a mouse that is affordable and still has some of the features gamers are looking for, such as six buttons, four DPI choices and a comfortable form fitting textured design. This is a very plug and playable mouse and really is all one would need. HyperX gaming also has a super cool splash page if you want to learn more about this mouse. The BenQ GL2460HM is a 24-Inch full HD 1920×1080 LED Monitor, which serves as a good standard everyday gaming type monitor. This is a TN monitor with a standard 60HZ refresh rate that has ben the choice for standard gamers for a while. Hey, one question. Why is a hard drive necessary? Also, if i must get one, which one should I get, and how many GB of space should I get? A hard drive is what stores the files for your pc — you will need some sort of storage, whether it be a hard drive like an HDD, or a solid state drive such as an SSD as examples. The hard drive holds everything from the actually operating system to the games that you play etc.